Model T Ford Forum: Model t head lights early .?.. 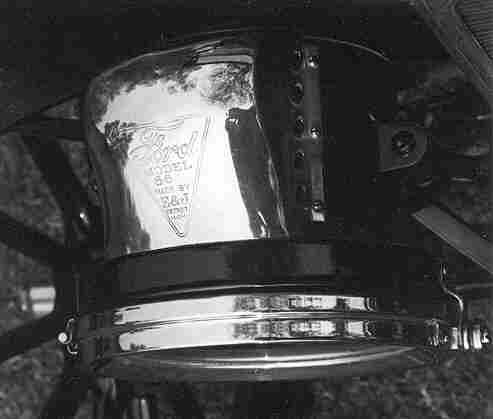 Model t head lights early .?.. Model T Ford Forum: Forum 2018: Model t head lights early .?.. Got a pair on my '13 is all I can tell you. Rust means steel painted black, so 1913 or 1914, I think 1912 and earlier were all brass ? Odd in that the lamps on my '13 and '14 have brass doors and the '13 also has a brass body that is painted black. A double oddity. The door is usually brass. On 13-4 lamps the Chimneys usually have the digits 66 under the word model. The 66 is off centre, the first 6 being deleted from the earlier 666 all brass lights used on 12 and earlier cars. At least, that is my experience of our Canadian sourced cars. It looks like a "normal" 1913-14 T headlight. The door is brass; there is just a bit showing at the bottom of the photo. I've seen them with both brass and steel bodies and jambs. I have seen ones with no number (like this), 66, 656, and 666. For Allan -- if you look close at Jon's photo I believe you can see the rim/door as well as the bonnet on top of the steel body are both brass. For Val -- again the brass rim/door is standard as well as the brass bonnet/top. That the body on your 1913 is brass painted black could be one of several things. Perhaps a transition time when E&J was told to use steel and paint the body black but they still had the brass bodies and they were allowed to paint those black. Or perhaps if the car was restored the person read that the 1913-14 cars should have a black body with a brass rim/door and brass chimney/top and they painted it that way. Or from memory, I believe there are some photos of early 1913s being delivered at the railway station that have the all brass headlamps. Maybe they came on the car and a restorer painted them? Or something else. For Jon -- the online encyclopedia has a lot of good information. Sometime more sometimes less. But for the lamps it has quite a bit. LAMPS: Made by Edmond and Jones (E&J), Brown, Corcoran or Victor. All were painted black with brass trim, replacing the all-brass types used until late 1912. Here's my opinion. Additions and/or corrections would be appreciated. The E & J headlight which has no model number is simply a continuation of the E & J 656, and may have been produced concurrently. Note the latch is a bit shorter than the previous 666 and 66 units and the door is formed to accept the shorter latch system. In all other respects it is the same lamp. This was a change to simplify the manufacturing process. 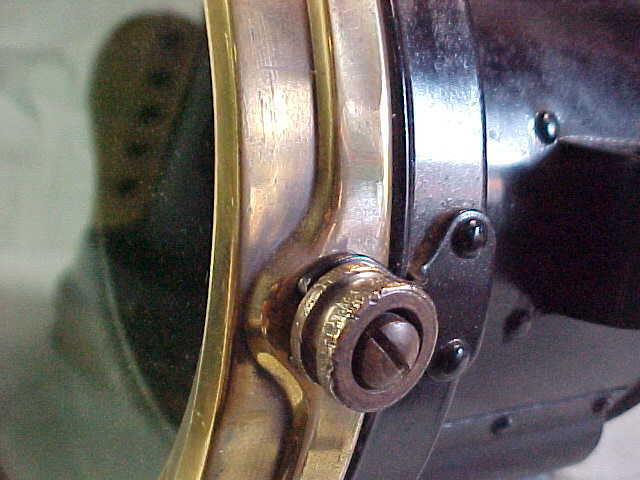 The earlier lamps had a captive nut for the latch thumbnut stud held on by a separate piece which was held in place with two rivets. This redesign made things easier and faster to produce. The E&J 656 replaced the 66, probably in late 1913 or early 1914. At some point, the "656" number stamp was just eliminated. It therefore comes as no surprise that the 1913 Canadian production would have been supplied with the 66 lamps while the 1914 cars may have had the CLASCO lamps and possibly some 656. I do not have access to my copy of Bruce's encyclopedia on this computer. 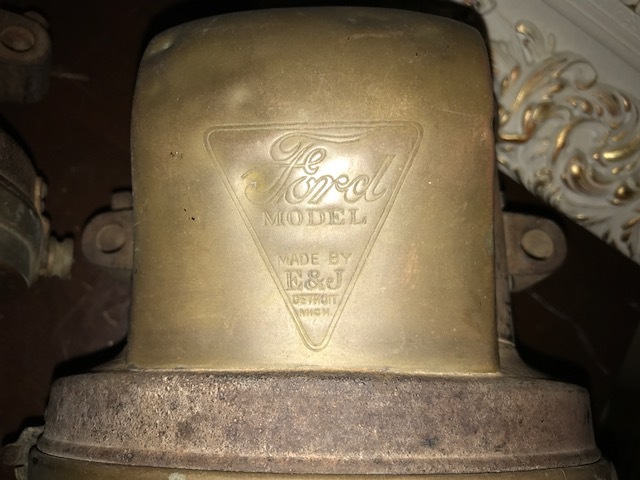 If you have it, check the list of parts for the gas headlights and you will note that the later version of the E&J is shown and designated for 1914, IIRC.